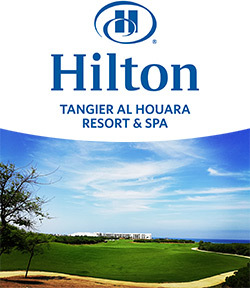 Hilton Tangier Al Houara resort & Spa is delighted to unveil its 304-room property (including 18 exclusive suites and 50 apartments 1 and 2 bedrooms) which will be the leading luxury hotels in Northern Morocco with a forecasted opening in March 2019. Set beside the Atlantic Ocean and framed by 18 ecological-hole course designed by Graham Marsh in collaboration with internationally acclaimed Vijay Singh, the hotel is offering world-class facilities on its ecological secluded resort. With its unspoiled Assilah 5km coastline offering ample space for guests to unwind within the spectacular surroundings, and make the most of the impressive facilities most notable include: Eforea Spa by Hilton, three swimming pools (included of one year-long heated and one kids’ dedicated pool), largest meeting facilities accommodating up to 1450 guest at a time, and an array of al fresco dining options, specialty restaurants and bars, kids club, golf academy, fully enlightened 9-hole pitch & putt. Al Houara Golf course offers spectacular views and distinctive challenges for both beginners and seasoned players. The par-72 course is integrating the culture and environment of the surrounding areas through a beautifully-landscaped course taking players on a memorable 6,915 meters’ golfing journey. The course development was approached from an eco-perspective, due to the resort’s dedication to biodiversity and habitat protection. 15 Minutes away from Tangier Ibn Battouta International Airport, 25 minutes’ drive from key CBD and commercial districts, you will be residing in the beating heart of Tangier. For nearly a century, Hilton Hotels & Resorts has been proudly welcoming the world's travellers. With more than 550 hotels across six continents, Hilton Hotels & Resorts provides the foundation for memorable travel experiences and values every guest who walks through its doors. As the flagship brand of Hilton Worldwide, Hilton Hotels & Resorts continues to set the standard for hospitality, providing new product innovations and services to meet guests' evolving needs. Hilton Hotels & Resorts is a part of the award-winning Hilton HHonors program. Hilton HHonors members who book directly through preferred Hilton channels have access to benefits including free standard Wi-Fi, as well as digital amenities that are available exclusively through the industry-leading Hilton HHonors app. Access the latest news at news.hilton.com and begin your journey at www.hilton.com or www.hilton.com/offers for the latest hotel specials. Hilton Worldwide (NYSE: HLT) is a leading global hospitality company, spanning the lodging sector from luxury and full-service hotels and resorts to extended-stay suites and focused-service hotels. For 96 years, Hilton Worldwide has been dedicated to continuing its tradition of providing exceptional guest experiences. The company's portfolio of twelve world-class global brands is comprised of more than 4,440 managed, franchised, owned and leased hotels and timeshare properties, with more than 730,000 rooms in 97 countries and territories, including Hilton Hotels & Resorts, Waldorf Astoria Hotels & Resorts, Conrad Hotels & Resorts, Canopy by Hilton, Curio – A Collection by Hilton, DoubleTree by Hilton, Embassy Suites by Hilton, Hilton Garden Inn, Hampton by Hilton, Homewood Suites by Hilton, Home2 Suites by Hilton and Hilton Grand Vacations. The company also manages an award-winning customer loyalty program, Hilton HHonors®. Hilton HHonors members who book directly through preferred Hilton channels have access to benefits including free standard Wi-Fi, as well as digital amenities that are available exclusively through the industry-leading Hilton HHonors app, where HHonors members can check-in, choose their room, and access their room using a Digital Key. Visit news.hiltonworldwide.com for more information and connect with Hilton Worldwide at facebook.com/hiltonworldwide, twitter.com/hiltonworldwide, youtube.com/hiltonworldwide, flickr.com/hiltonworldwide, and linkedin.com/company/hilton-worldwide.